If you’ve tried home whitening kits, you’ve probably found that the results are only temporary. For this reason, it’s a good idea to try Zoom teeth whitening, which we offer at out Blackburn Dental Clinic. This is one of the top treatments used by dental offices today and it gives long term whitening results. In fact, you may be surprised to find that the Zoom procedure will give you up to 8 shades whiter teeth after a single session. Here is a closer look at how does zoom teeth whitening work and the benefits it offers you. Zoom teeth whitening takes only about an hour and it’s a process that is quite simple. To start out, you’ll have a mouth guard put in your mouth around the gums and lips to protect them while exposing your teeth. Then a special gel will be applied to your teeth, which helps to reduce tooth discoloration and break up any surface stains. This gel also works by helping the special Zoom light get deep into your teeth so you get the best results. Once you have the gel applied to your teeth, special laser light will be applied to the teeth. This will start the process. You’ll go through three sessions of 15 minutes where a gel is applied and then your teeth exposed to the light. Once the procedure is done, you’ll have your results right there in our Blackburn Dental Clinic. 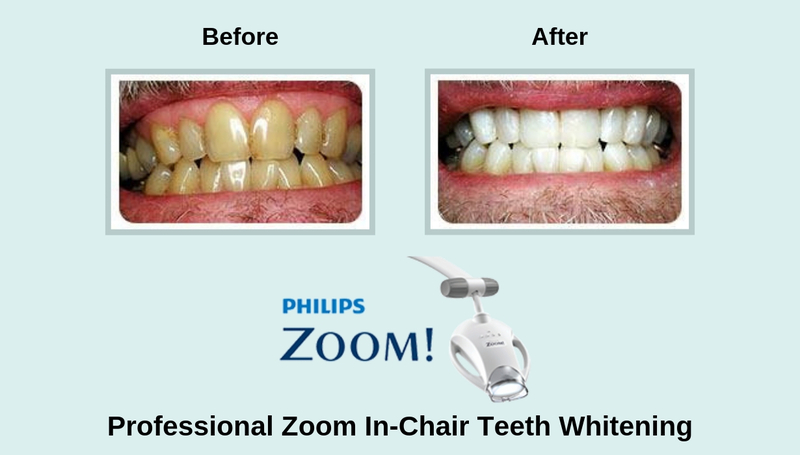 By continuing to use Zoom whitening products, you can make sure you maintain those great results. You’ll find that teeth whitening with Zoom come with some excellent benefits. First, you’ll find that even people who have very sensitive teeth can use this option. You can get great results without having to worry about pain in sensitive teeth. If you have deep stains from wine or coffee, this process will work for you too. Another great benefit is that the treatment time is fast. It takes about an hour or less and you’ll get instant results. There are few side effects to worry about and the procedure doesn’t cause any discomfort or pain. If you’re tired of wasting money on home whitening treatments that don’t offer great results, Zoom whitening may be a great option for you. We offer this whitening service at our dental clinic, so if you’re ready for great whitening results, Book your appointment today.